I would like to receive occasional information and updates from Pictures Reimagined and jumblebee. For descriptions, measurements and artist biographies, please click on each lot. 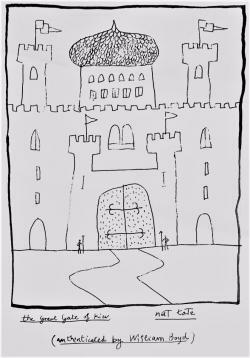 Pictures Reimagined is part of 'Night Under The Stars', The Passage's annual fundraising concert. Excerpts from Pictures at an Exhibition will be performed at this year's concert, which takes place at Southbank Centre's Royal Festival Hall on Tuesday 7 November. This auction will be available until midday on Monday 6 November when online bidding will close. Bidding will re-open at the Night Under The Stars post-concert reception on Tuesday 7 November, concluding at 22:30. If you are unable to attend the reception you can still give yourself a good chance of winning by placing a proxy or maximum bid on this page. We will then carry your bid over to the live silent auction and continue bidding on your behalf up to your maximum. The Passage would like to thank Penningtons Manches who are sponsoring the auction. Pianist Stephen Hough has performed with most of the leading orchestras and played recitals in major concert halls around the world. His is a laureate of the Royal Philharmonic Society Award, winner of eight Gramophone Awards and the first classical performer to be made a MacArthur Fellow. As a composer Stephen has been commissioned by the Wigmore Hall, The National Gallery, Westminster Abbey, Westminster Cathedral and the Berlin Philharmonic Wind Quintet. Named by The Economist as one of the world's top 20 polymaths, he has written for The Guardian, The Telegraph, The Times, Evening Standard, and published his first book The Bible as Prayer in 2007. Cast in the colours of the French flag, Stephen’s work is a reimagining of Mussorgsky's “gossipy” seventh Picture, Market Place at Limoges, and includes fragments of Limoges porcelain. Nicknamed “Ken the Pen” for his fluid draftsmanship, architect Ken Shuttleworth is a former partner at Foster+Partners, where he is credited for the design of 30 St Mary Axe (aka The Gherkin), Wembley Stadium and City Hall amongst other iconic London landmarks. In 2014 he set up his own studio, MAKE Architects, which has been responsible for the development of The Copper Box Arena (built for the London 2012 Olympics), the City of London Information Centre, and the award-winning Monument Building. 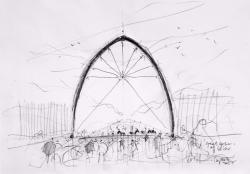 Ken’s pencil sketch is a contemporary reimagining The Great Gate of Kiev. Jill Leman studied at The Central School of Art & Design in London, and has exhibited widely - including at the Royal Academy's Summer Exhibition. In April 2017 she was appointed the first female President of the Royal Watercolour Society. 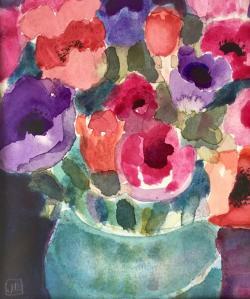 Working mainly in watercolour and acrylic, she is known for her depictions of flowers and still life. A frequent visitor to Paris, Jill has chosen to represent the Tuileries Gardens with a painting of anemones which, according to Greek mythology, grew from the tears of Aphrodite as she wept over the grave of Adonis - just as Mussorgsky's suite emerged from his mourning of his dear friend Viktor Hartmann. Michael Kenna is best known for his unusual black and white landscapes featuring ethereal light achieved by photographing at dawn or at night with exposures of up to ten hours. Over twenty books have been published on his work, examples of which are held in permanent collections at the Bibliothèque Nationale, Washington’s National Gallery of Art, Tokyo’s Metropolitan Museum of Photography and the Victoria and Albert Museum. 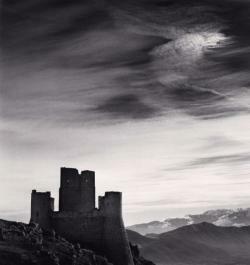 Michael has donated a photograph from his latest exhibition, Abruzzo, which perfectly encapsulates the romanticism of Mussorgsky’s second Picture. 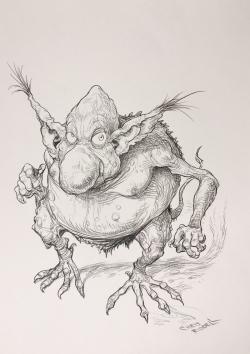 Chris Riddell is a British illustrator, children’s author and renowned political cartoonist whose work appears regularly in The Observer, The Literary Review and The New Statesman. He has won three Nestlé Smarties Book Prizes, two Kate Greenaway Medals, and the British Librarians' annual award for the best-illustrated Children's Book. In June 2015 he was appointed the UK’s ninth Children's Laureate. 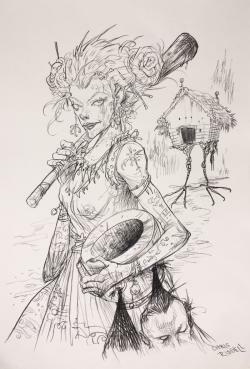 Chris drew his reimagining of Mussorgsky’s most fearsome character– the witch Baba Yaga of Slavic folklore who lives in a hut which stands on chicken legs – live on Twitter. Chris drew his reimagining of Mussorgsky’s “angry gnome with sharp teeth” live on Twitter. Sir Thomas Allen is an established star of the great opera houses of the world. He has sung over fifty roles at the Royal Opera House, and in 2012 he celebrated his 40th anniversary of his debut with the company. In the New Year’s Honours of 1989 he was created a Commander of the British Empire, and in the 1999 Queen’s Birthday Honours he was made a Knight Bachelor. Among his proudest achievements is having a Channel Tunnel locomotive named after him; and most recently, being awarded the Queen’s Medal for Music 2013. 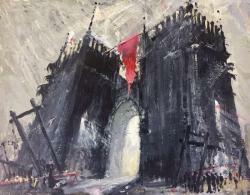 In his spare time, Sir Tom builds models and paints – his prowess with a brush is wonderfully demonstrated in his gothic reimagining of the Great Gate of Kiev. Photographer David Stewart began his career photographing punk bands including The Clash and The Ramones. In 2015 he won The Taylor Wessing Photographic Portrait Prize, and in 2016 he was presented with The Royal Photographic Society award for outstanding achievement and excellence in the fields of Editorial, Advertising and Fashion Photography. He shoots on a large format camera which brings out great detail in his large scale works. Hartmann's pair of portraits touch on wealth inequality, and in reimagining these David has taken into consideration "how the distance between rich and poor can be so close, especially in the current cultural landscape - the viewer is left to interpret both characters from their own perspective." Born in New Jersey, 1928 Nat Tate studied painting with Hans Hofmann in Massachusetts. 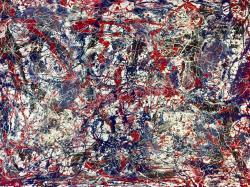 His debut exhibition was displayed in New York, 1952 whereafter he quickly became known for his abstract expressionism. A recurring motif in his works is the representation of bridges, which was believed to be partly inspired by his readings of the works of Hart Crane. Following a trip to Europe in 1959, the increasingly irrational and alcoholic Tate insisted on borrowing or buying back his own works. He spent the rest of his life trying to improve these works and ultimately, unhappy with his creations, destroyed almost all his collection. Emulating the death of Hart Crane, Tate committed suicide on January 12, 1960 by jumping off the Staten Island ferry. Nat Tate was the subject of a biography written by William Boyd which hoaxed the art world . Nat Tate never existed. 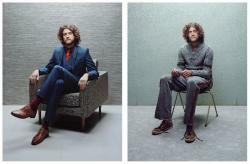 Arno, was born and raised in South Africa and is known for his portrait work in advertising and fashion. His commercial work has been widely published internationally, including in Wallpaper*, Marie Claire, Cosmopolitan, GQ, and The Guardian. His portraits are represented in private and corporate collections internationally, as well the National Portrait Gallery. Arno's reimagining of Catacombs has its origins in mental health and psychology: "the 'I' is the first person singular and the first Roman numeral, indicating the double disappearance of the homeless individual with mental health needs from the self and society." 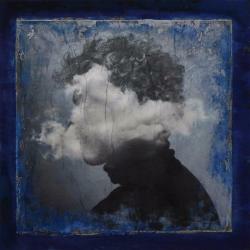 Richard Allen studied Fine Art and Illustration at Central Saint Martins College, London. As an illustrator, his clients include the New Yorker, Esquire, Financial Times, Nokia and Greenpeace; his Trump Wave, published in the Sunday Telegraph, won him both the Editorial Illustration and Moira Gemmill Illustrator of the Year prizes at the 2017 V&A Illustration Awards. In 2012 he returned to painting, winning the Sky Arts Landscape Artist of the Year award in 2016. 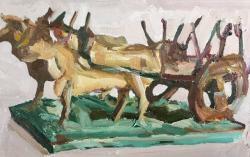 Richard's work is a reimagining of Hartmann's painting of "a Polish cart on enormous wheels, drawn by oxen" (now lost) which inspired Mussorgsky's fourth Picture, Bydlo. Annie Tempest is a British artist and cartoonist initially known for her popular cartoon strip The Yuppies which ran for seven years in the Daily Mail and now for her acclaimed cartoon strip Tottering-by-Gently which has graced the pages of Country Life magazine since 1993. In 2009 she won the prestigious Pont Prize for her portrayal of the British Character – the highest accolade in her profession. 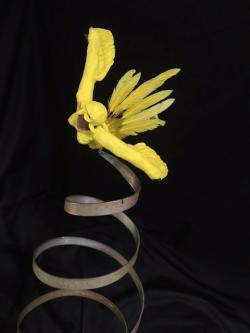 Annie's creative expression has also found a new outlet in sculpture, her inaugural sculpture exhibition ‘Play as cast’ was held at The O’Shea Gallery in April 2012. Her reimagining of Mussorgsky's Ballet of the Unhatched Chicks is a tribute to aviator Amelia Earhart, whose bright yellow Kinner Airster biplane was nicknamed "The Canary"
Baritone Simon Keenlyside has sung at all the world's most prestigious opera houses, including New York's Metropolitan Opera , the Vienna State Opera, and the Royal Opera House in Covent Garden - where he created the role of Prospero in Thomas Ades' The Tempest and Winston in Lorin Maazel's 1984. He won the Olivier Award for outstanding achievement in Opera in 2006, the ECHO Klassik Male Singer of the Year Award in 2007, and was named Musical America’s Vocalist of the Year in 2011. 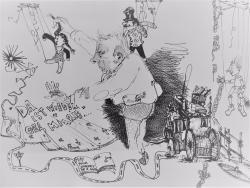 When not singing he enjoys anything zoological, diving, walking, drawing, painting and fly-fishing - his drawing was inspired by Mussorgsky's Gnomus. David Tovey is a formerly homeless artist, educator and activist who works in a range of media. He has exhibited at Somerset House and Tate Modern, and founded the UK’s first One Festival of Homeless arts. David speaks regularly at housing and homelessness events, and teaches art to people experiencing homelessness at The Passage. David's work is based on Hartmann's pair of contrasting but connected portraits, and consists of a large self portrait on a canvass left in the doorway of a homeless shelter, and a painting of Gavin - "the man who stopped me from taking an overdose and saved my life".